Print the Love was recently featured on WCCO, a premier Twin Cities news station! Click image to see full video! See our story recently published in the Star Tribune, the Sun Post, and seen on WCCO 4 News! Print the Love’s Executive Director and Founder, Ceallaigh Anderson Smart, was recently featured the Let's Give A Damn podcast and in Holl and Lane, for their Impact Issue. Professionally, Ceallaigh Anderson Smart was a nonprofit consultant in the summer of 2013 and was traveling to Rwanda for work. Personally, at that time, she was in the an abusive marriage and had recently developed PTSD. Travel, especially to Africa, had always been a passion and healing to her soul. While in Rwanda she was able to travel to small towns and villages, schools, hospitals, churches, a prison, and engage with the rich and the poor, from politicians to the homeless. And one thing was true across the board. Everyone loved to have their picture taken. But of course it was the eagerness of the children that had the most impact on her. As soon as she took a picture, each child always wanted to look at the back of her digital camera to see themselves or their family and friends. She desperately wanted to be able to print one out and give it to them! Thinking to herself, "you should have this picture, not me." Thus Print the Love was born! So she vowed to be back to Rwanda ready to give away instant photographs! As soon as she got home that summer, she googled the idea of giving away photos to those who likely have none and could find no one doing this kind of work on a larger scale. She couldn't imagine not having a single picture of herself in childhood or of her family or children. A luxury she took for granted. Ceallaigh traveled back to Rwanda the following year in 2014, during the 20th anniversary of the genocide with an instant camera in tow as she had promised to herself. She raised funds through crowdfunding and was able to give away 1,000 instant picture gifts to people who most likely have never had a printed photo of themselves - a treasure that they will likely keep for the rest of their lives. The reactions of the people were more profound than she had expected! It was a simple small gift, a random act of kindness, to say "You matter!" to each person, child, new mother, or family she encountered. The project was a complete success! It was also the first time that she stopped having panic attacks. Personally, she began to heal by doing something so seemingly little. She wanted to counteract the evil she felt at home, telling her she was no good. As she told others that they mattered, she started to believe for herself. 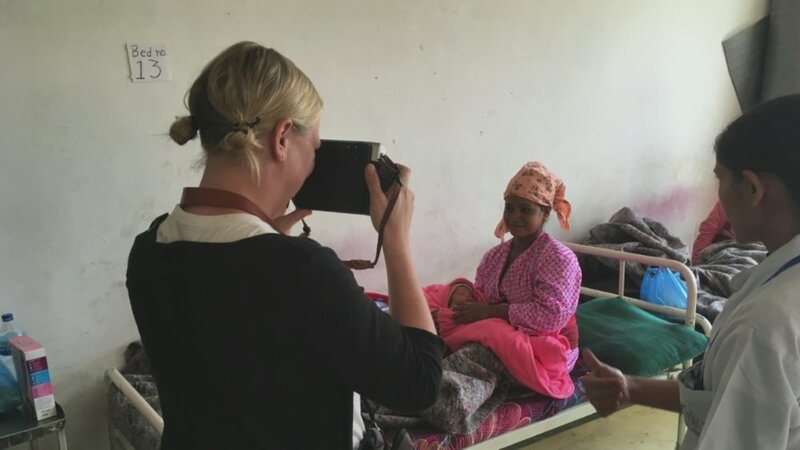 What an amazing gift Ceallaigh received when she was able to witness her vision come alive through the smiles and joy of the Rwandan people as she handed out instant photographs. Many people came forward, even strangers, to support the project with their donations. She wanted to see the vision and passion continue beyond Rwanda. So she assembled a team of people who were passionate about growing an organization to enable many more people worldwide to feel the infectious joy and healing of giving and receiving instant photographs. In 2015, Print the Love became a 501(C)3 nonprofit with the vision to visit the poorest countries on each continent with a message of the importance of self-worth for all. In tandem, she wanted to invite others on the journey of healing through giving and travel. She is now free from her abusive marriage and is able to manage her PTSD symptoms and is so excited to see how Print the Love grows, spreading seeds of love around the world.